COTA NT has a comprehensive volunteer program which follows the National Standards for Volunteer Involvement guidelines with many interesting and diverse roles available to seniors including: Peer Education, Volunteer Bus Driving, Event Support Volunteering and Office Administration. Volunteer Minibus Driver, COTA NT – A volunteer driver helps support our Multicultural Aged Sponsorship Program by driving our (new) 12 seater minibus enabling seniors from a CaLD background to make connections to their peer groups, language and community helps prevent feelings of isolation and neglect. Volunteer Coordinator, COTA NT – The Volunteer Manager/Co-Ordinator supervisers volunteers, provides direction, coordination and consultation for all volunteer functions within COTA with the aim of strengthening programs and involving a community of supporters. Volunteer Events Officer, COTA NT – The Events Officer helps to co-ordinate events and program activities including administration, promotion and volunteer recruitment. Volunteer Marketing Assistants, COTA NT – Marketing Assistants help to provide age-friendly information across a range of media including: newspaper, digital and print community noticeboards, posters, leaflets, email, website and social media. Volunteer Peer Educator (Step Forward Together project), COTA NT – Peer Educators encourage older people to be active partners in their wellness and enablement choices by increasing their skills and knowledge about active ageing. Volunteer Website Editors, COTA NT – Website editors help to update COTA’s written and photographic content on website and social media pages. Volunteer Receptionist, COTA NT – Professional and friendly face required to greet, welcome and assist visitors to COTA appropriately. 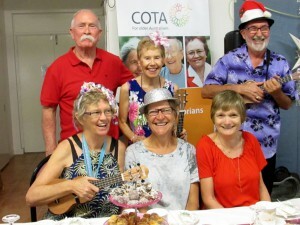 Volunteer Round Table Secretary, COTA NT – Be responsible for a range of administrative tasks pertinent to the Independent Seniors Round Table and Seniors CaLD Round Table. Volunteer Maintenance Officer, COTA NT – All round handyman to assist with the upkeep and maintenance of Spillett House and its backyard. Volunteer Administration Officer, COTA NT – To assist with the management and execution of administrative, executive and project support activities within the COTA office. Volunteer Multicultural Engagement Officer, COTA NT – Officer sought to support the the PICAC (Partners in Culturally Appropriate Care) program. The volunteer program enables members to take an active part in COTA NT and assist with the organisation’s continued development. Our program is designed to have a dual role. It seeks to use the talents, combined experience and skills of our membership base while providing opportunities for volunteers to engage in tasks where they can develop new or existing skills and actively contribute to their organisation. All volunteers must be holders of a current OCHRE card. To register your interest in becoming a volunteer, please contact us.